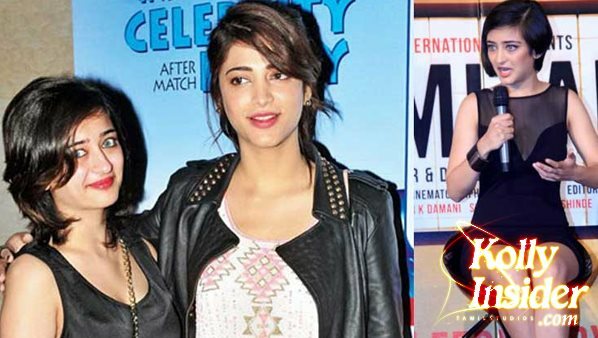 Kamal Haasan’s daughters Shruthi Haasan and Akshara Haasan are acting in the films. Shruthi Haasan is one of the leading actresses of Tamil, Telugu and Hindi film industries. She has lots of films in her hands. She is currently pairing with Vijay in the film titled Puli. The shooting of the film is going on in top gear. After this, she will be donning the female lead role in a film which has Ajith in the lead role. This film is being directed by Siruthai Siva. The shooting of the film will also commence soon. Similarly her sister Akshara is also set to rock the tinsel world. She has already acted in the Hindi film which had Amitabh Bachchan and Dhanush in the cast. She won laurels for her acting. After this film, she is being flooded with offers. Shruthi Haasan while speaking about her younger sister Akshara said, "My sister Akshara is very talented in taking decisions. She has also the boldness to stand in her own legs. She is also very clever. She never needed my help in her cinema career. None of the women expect any help from others these days. They take care of themselves in a better way. My Hindi film Gabbar is Back and my father’s film Uthama Villain are releasing on the same day. I want both the films to be successful ones."